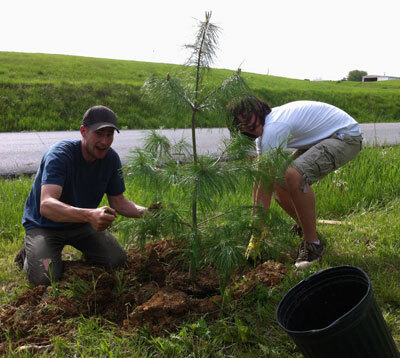 This WV Project CommuniTree planting was held on Saturday May 10th 20104 at the Jefferson County Transfer Station. The weather turned out to be better than expected: it was partly sunny with warm temperatures and a chance of storms in the afternoon. All the materials and trees had been brought to the planting site the day before which allowed me to be present and greet the volunteers as they arrived. Alana Hartman and Molly Barkman arrived (with donuts!) before any volunteers to help set-up the planting. By about 9:15am, we had about 6 student volunteers, five girls and one boy, and several parents and we did a brief introduction and welcome. 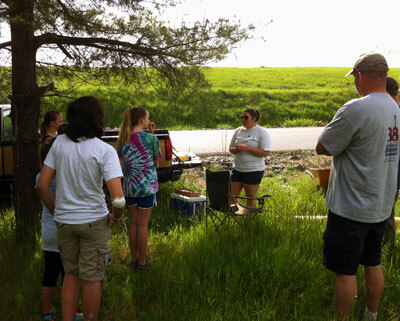 CommuniTree Liaison Alana Hartman spoke to the group about trees and the WV Project CommuniTree program. 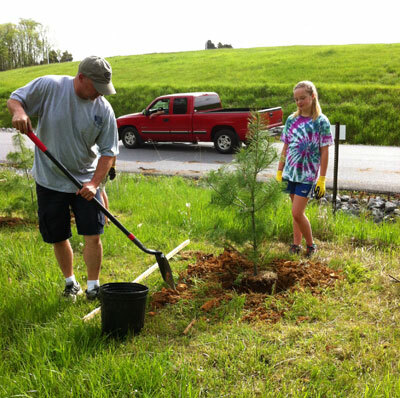 Cacapon Institute’s Outreach Coordinator Molly Barkman gave an instructional demonstration on how to properly plant trees. The holes had been dug the day before with a hydraulic auger and the first step was preparing the holes for planting. Some of the holes were a little deep, so we used a scoop of compost to help fill the holes to the proper level before planting the trees. After adding compost to the holes we got to it and sent the volunteers out to plant. After all the trees were in the ground, which took about an hour, Molly instructed the volunteers on mulching, staking and tree protection. 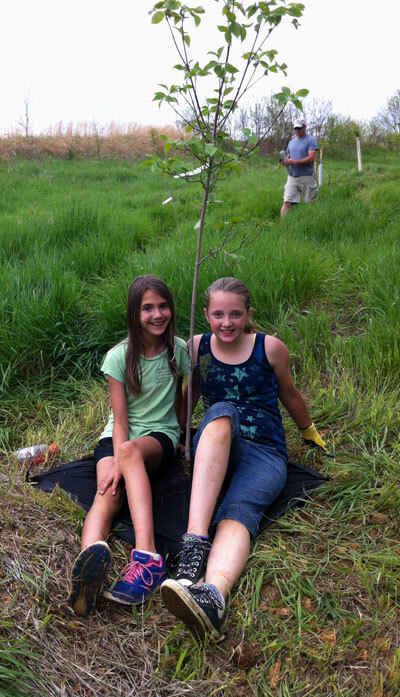 Jefferson County Solid Waste Authority donated two scoops of mulch for this project. 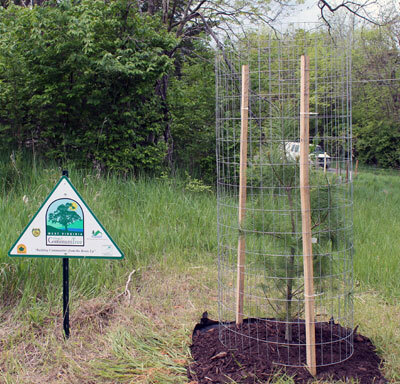 With Molly and Alana’s guidance we got all the trees staked, caged and protected by about 11:30am.We cleaned up the tools and plant pots, thanked all the volunteers and took pictures of the volunteers with the CommuniTree sign. About two hours after the planting a thunderstorm with heavy rain moved through the area and the trees got a good drink!